I have used these hoodies for years. Love them. Bought this for my wife to replace a very old and ugly zip-up hoodie. She was extremely happy with the fit and quality. The fitting calculator was very helpful. Life is too short to not buy quality products. It’s the perfect hoodie! Good quality. Carhartt is top quality. I size up, they run small in my opinion. True to size with plenty of extra room! Definitely true to size! I usually order Carhartt jackets in size large because I like the extra room for layering. Since this was listed as a relaxed fit, I ordered my true/t-shirt size in medium and I’m very impressed how comfy it is! Not too big and definitely not tight at all. The sleeves are nice and long and the fabric is super soft and stretchy! I could wear this every day for sure! I stocked up and got fudge heather (burgundy), burlwood (pink), and olive! 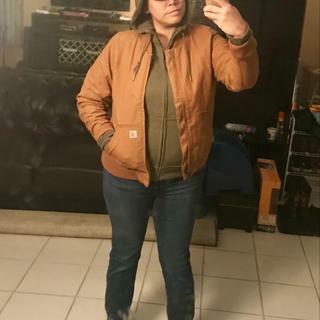 I love them all and they all are so comfy and look great under all my other Carhartt jackets for those super cold nights! Thanks again Carhartt! 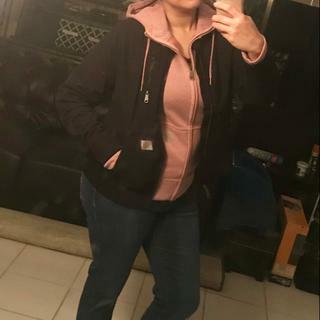 For reference, I’m 5’8, 185 lbs, 38C bra size and the medium is definitely my true size even though I love my jackets in size large! This hoodie is exactly what I was looking for. It fits perfectly and keeps me warm and the wind out of my ears. I would definitely recommend it to other women. 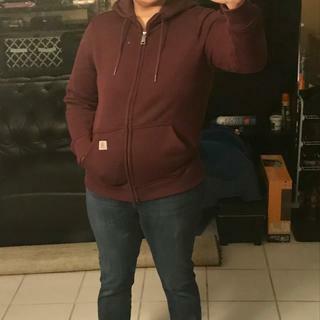 Heavy hoodie, small fit me perfect (5'6", 155#). Hood size is great. The zipper goes all the way up and keeps your neck warm too, it's wonderful. Washes great; I hang it to dry (like all my hoodies) and haven't had any issues there. Love these hoodies! I live on them! I bought this for my daughter. I love the color (Elm Heather) and the way it is well made. The hoodie came faster than expected which was a plus. Most important my daughter loves it and says it keeps her warm. Will be ordering one for myself.. I love my zip hoodie! I have 3 and I love all of them. Super comfy, very durable, true to size. I love this sweatshirt! Very good quality and the fit is perfect, I highly recommend to anyone looking for something warm and durable. The fit is perfect. The size chart helped a lot in determining between small or medium. I love the lining in the hood and how the zipper zips all the way up my neck. Overall it is a very nice sweatshirt. Excellent quality. This isn’t your average hoodie! This jacket keeps me pretty warm, dare I say hot! If you like your clothes fitted I suggest ordering a size down. I typically wear a large and this large was a bit roomy, but it is for work so it made sense to me. I’ve washed it several times and the black has yet to fade and it doesn’t get those annoying knots thatvsome cotton fabic tends to get after wearing it for awhile. I bought this sweatshirt to replace my old hoodie thinking that is was the same item as my tried and true Carhartt hoodie which I have worn for over 10 years only to find out that the new one has only 55% cotton and is now starting to pill. It may be softer but pilling is unacceptable. My old Carhartt hoodie which I love is 75% cotton and much sturdier and comfortable. Great sweatshirts. Great quality and just what the recipient wanted! Very happy! Very good quality, good deep red color with some black running through it. I am usually in between a medium and a large, and this large fit perfectly, but had no extra room. Fits exactly as expected! looks good! Love this hoodie it is soft and warm, fits true to size if unsure I would size up so you can layer underneath. Received this as a gift, by far one of my favorite hoodies. Well made and perfect for in between seasons. Thank you for your comments. Please contact us at 1 800 833 3118 if you need further assistance. Warm, good quality. Fits true to size. Great fit and excellent quality!Not made in China!Love the color! This is by far the most comfortable hoodie!! I have several of these & they last forever! The Arms are Long Enough! Seriously though; sitting at my desk freezing today so I run down the street to the only clothing store in town. Stumble upon a rack of women's Carhartt and think "I've lived in Maine for 35 years and don't own any Carhartt; it's time". They have one XS in Navy on the rack, I grab it to try on and miraculously, it fit perfectly, even the sleeves are long enough (for reference, I am 5'10" 130 lbs with gorilla arms). Really happy and now warm at my desk currently. I'm sure this will wash & wear just fine. Love this hoodie! Comfy and cute. This sweatshirt is so comfortable! Love the fit. Perfect fit. Will be ordering more. I love this sweatshirt! It’s warm, comfortable and good for year round! Great style for any looks! This jacket is great! I wear it around my work space and get tons of compliments. It's a great, soft, and comfy hoodie that offers a more streamline look than bulky workwear. I bought this in Navy, in my size ...according to the Carhartt chart.... and have worn it approx 6 months. I wear it daily, even in the winters, as it gets cool at night in N.D. Mine's been washed maybe 30 times and has held up well. I appreciate the large hand pockets, as they hold my dog leashes and keys. the arm length is great and the sizing is just right. This hoodie is comfortable and I'm going to get it in another color! Perfect hoodie to throw on and instantly be comfortable. Super soft inside! I LOVE IT!!! My second one! I mentioned in my first review about how I wished they would have sewn an inside pocket though for phones, keys, etc, and they still haven’t done that. But I have been able to do that myself. That’s the only complaint I have. Otherwise it’s a awesomely warm & versatile jacket. Washes up nice too. Thanks for the best most comfortable well made jacket ever!! Love, love, love it! It feels good on, fits great with a little wiggle room for clothes underneath. Very well made also. I highly recommend this product. Ordered in cranberry. Was a little lighter than the picture (more orange than pink) but still love it. Thick material and fits perfectly. I really like this zip up hoodie! its very warm and durable and looks good too! It is a bit bigger than normal, but fits good enough to still wear. The only issue is the material gets a bit balled up on the outside after a few washes. Other than that i really enjoy it! Love love love! Very comfortable !!! It wears well and is very warm. I would definitely recommend this to a friend. Large fits big and I did the size chart but it’s roomy enough for layers. It’s heavyweight but doesn’t feel that way when on. Love it and color is just like the pic! Will you be getting the size extra small in burlwood heather anytime soon? BEST ANSWER: The Burlwood Heather color is being discontinued and we do not expect to receive any additional stock. Do you still make WK012? BEST ANSWER: No, style WK012 has been discontinued. What is the true color of the fudge Heather? Is it more plum or brown? BEST ANSWER: It depends on what color is under it but I think it is a kind of grey beige. I think people see color different so I might be wrong. The fudge heather is definitely a plum color! It is more plumb colored. I love it! Does this hoodie have a metal or plastic zipper? BEST ANSWER: This style has a metal zipper. I thought the jackets was always 100% cotton when did you change the fabric ? BEST ANSWER: Style 102788 has always been a fabric blend. Will the clarksburg full zip up women's hoodie be available in dark green soon? I can only wear this color at work? BEST ANSWER: We do not currently offer this style (102788) in a dark green color. We will have an Elm Heather color for Fall 2018. Is this similar in comparison to the mens' K122? If not, what would be the closest in comparison in the women's styles? BEST ANSWER: This would be the most similar zip-up hoodie to the K122 in our women's line. Please provide garment measurements (chest, sweep, length) for an extra small and small? BEST ANSWER: In XS, the chest is about 39.5," and in S, it is about 41.5." The sweep is about 37" in XS, and 39" in S. The length of the XS is about 25.75" and about 25.88" in S.
Your "True Fit" puts me right in the middle range of how a small will fit. Can I get by with wearing an extra small? Thanks. BEST ANSWER: Although this garment is true to size overall, it generally has a bit of extra room. If you go down a size, it may fit in a slimmer way, or it may be a bit too small. Please contact us with your measurements for further guidance. What is the length of a small? BEST ANSWER: The front length is about 25 7/8." Do you know the actual garment measurement in inches for the chest for a small and medium? Thank you. I'm between a small and medium usually. BEST ANSWER: The small chest measures 41.5 inches from the armhole and the medium measures 43.5 inches. Does this jacket shrink in the washer or dryer at all? BEST ANSWER: As long as the care instructions are followed, it should not shrink more than 2-4% over the life of the garment. what is the percentage of cotton in the navy sweatshirt? BEST ANSWER: The navy fiber content is 55% cotton/45% polyester. I am looking for a hooded sweatshirt similar to the Carhartt I presently own, only in a Women's size. It zips up the front and the lining is made out of material similar to insulated underwear material. The style number I found on mine (located at the bottom left side of the tag) is K129NVY. Is this CLARKSBURG FULL-ZIP HOODIE what I am looking for? Meaning, is the lining the same? BEST ANSWER: The K129 was a men's thermal lined zip-up hoodie. The current version of this is the men's Rutland (style 100632). We apologize, but we don't make a thermal-lined sweatshirt for women at this time. You may like the Clarksburg Sherpa-Lined Sweatshirt for women (102797) if you are looking for a lined, zip-up women's hoodie. What is the length in Large, XL, and 2X? What is the length of this hoodie? BEST ANSWER: It is 25.5" in a size medium.